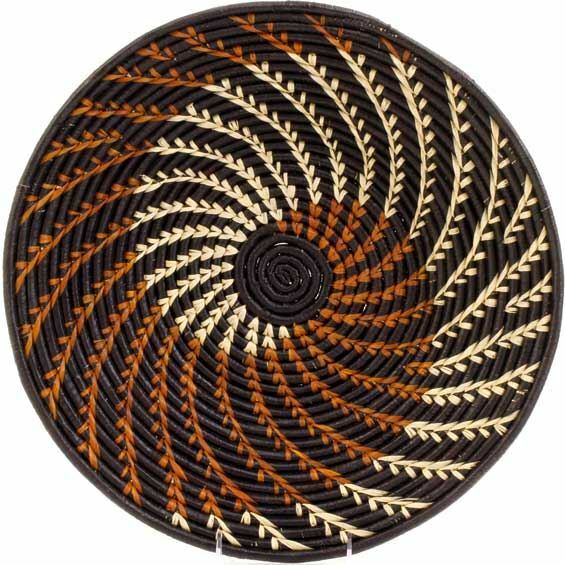 Brightly colored dyes and inventive, progressive patterns make these handmade baskets popular for wall displays. A loop on the back of the basket makes it easy to hang. Although each basket is uniquely handwoven and thus varies slightly, you will receive a basket that looks very close to this photo. Bukedo is the local term in Uganda for banana leaf stalks. Along with raffia that comes from palm trees, these materials are renewable, plentiful resources. The mission of this weaving group is to support as many other women as possible through the promotion of their handcrafts. Traditionally used for serving food, they are created by tightly wrapping smooth raffia over coils of bukedo stalks. They look great mounted on a wall, propped up on a shelf, or even sitting on a table. A loop on the back of the basket helps with hanging.